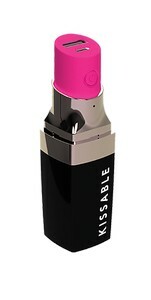 Give your handbag a makeover with our clever Kissable?external battery pack. It?s the perfect combination of beauty and brains, allowing you to stay stylishly connected throughout your day and night. Guaranteed to turn heads, the Kissable will plump your phone?s battery with 2600mAh of lasting, beautiful power.